On July 27, 2018, the Moon passed through the shadow of our planet, producing the longest lunar eclipse of the century. The face of the Moon turned red for 1 hour and 43 minutes - an event visible from every continent except North America. The greatest eclipse (20:22 UTC) took place at or around midnight for Madagascar and the Middle East. 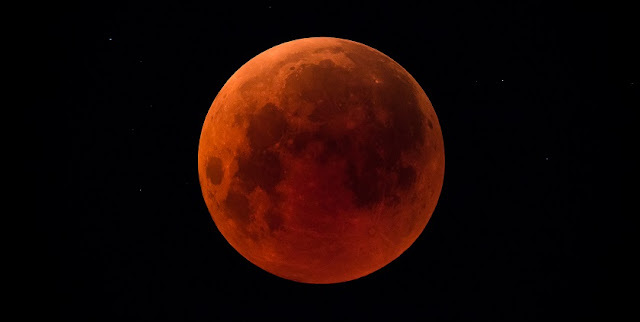 Europe and Africa seen the greatest eclipse during the evening hours (sometime between sunset and midnight on July 27), whereas most of Asia, Indonesia and Australia watched the greatest eclipse in the morning (sometime between midnight and sunrise on July 28). From the Cape of Good Hope to the Middle East, and from the Kremlin to Sydney Harbour, thousands of people turned their eyes to the stars to watch the Moon, which turned dark before shining orange, brown and crimson in the shadow. Total lunar eclipses are also sometimes called Blood Moons because of the reddish-orange glow the Moon takes on during the eclipse. On the day of the eclipse, the Full Moon is also at its farthest from the Earth, so it looks a little smaller in the sky, making this a Blood Micro Moon eclipse. “It’s called a blood moon because the light from the sun goes through the Earth’s atmosphere on its way to the moon, and the Earth’s atmosphere turns it red in the same way that when the sun goes down it goes red,” Andrew Fabian, professor of astronomy at the University of Cambridge, told Reuters. At the same time, Mars is traveling closer to Earth than it has done since 2003, so some observers might see what looks like an orange-red star - and is in fact the red planet. “It is a very unusual coincidence to have a total lunar eclipse and Mars at opposition on the same night,” said Robert Massey, deputy executive director of the Royal Astronomical Society, who watched the eclipse from the Mediterranean Sea. For an especially long-lasting total lunar eclipse of 1 hour and 43 minutes to occur, the moon has to pass through the central part of the Earth’s shadow. The next lunar eclipse of such a length is due in 2123. The previous total lunar eclipse on January 31, 2018, didn’t last as long (1 hour and 16 minutes) because the moon passed to the south of the shadow’s center; and the next total lunar eclipse on January 21, 2019, won’t be as long either (1 hour and 2 minutes) because it’ll pass to the north of the shadow’s center.